The 2015 Ideal Home bathrooms feature Silestone Quartz countertops and shower walls installed by Surface One. Consentino, manufacturer of Silestone, is the leading producer of quartz surfaces and the innovative creator of Bacteriostatic countertops. Silestone was created with the purpose to merge high quality design with increased durability for high traffic use bacteria resistant use. The non-porous man-made surface is a beautiful option that is similar to marble in appearance while also highly resistant to stains such as makeup or oils that may be present in a bathroom. Silestone Quartz by Consentino resists scratches and is comparable to granite in durability. There is no shortage of colors to choose from, Silestone Series include Ocean, Galactic, Stonium and many more, consisting of over 60 colors such as White Zeus Extreme, Tigris Sand, Atlantis, Stellar Sun, Green Fun and Blue Enjoy. Surface One fabricated and installed full wall slabs of Silestone Quartz in the Master Bathroom shower of the 2105 GBAHB Ideal Home. 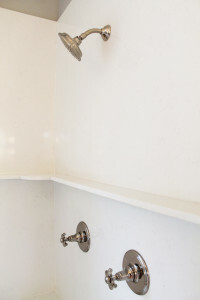 Cleaning is a breeze with no grout lines to scrub. The seamless Silestone Quartz slabs add a crisp clean flair that complements the bathroom design and are easy to clean. Silestone Quartz countertops were also installed by Surface One in the kitchen, butler’s pantry, laundry room and bathrooms. Gorgeous color combined with durable design make Silestone Quartz the perfect choice for every room in the house. View a gallery of images of the 2015 GBAHB home. 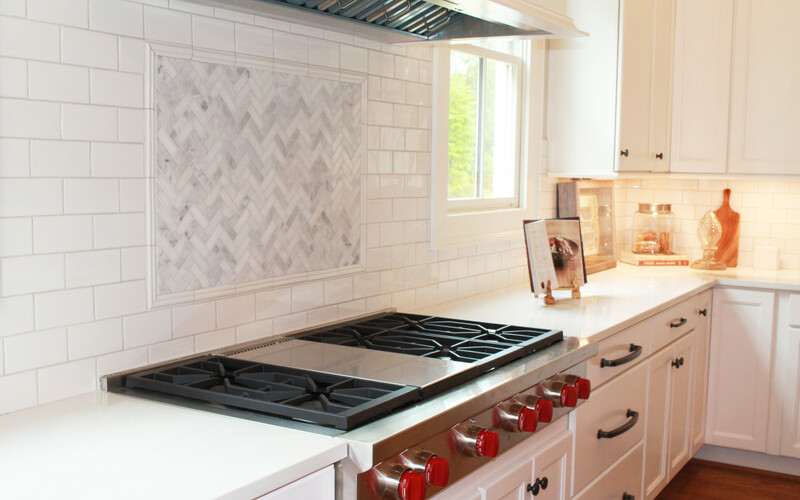 Learn more about Silestone Quartz in our article Benefits of Installing Silestone Quartz in Your Home. 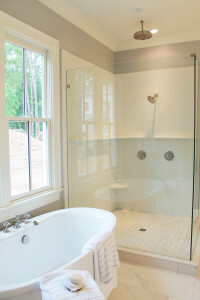 Contact Surface One today for more information on transforming your bathroom into a luxurious retreat. 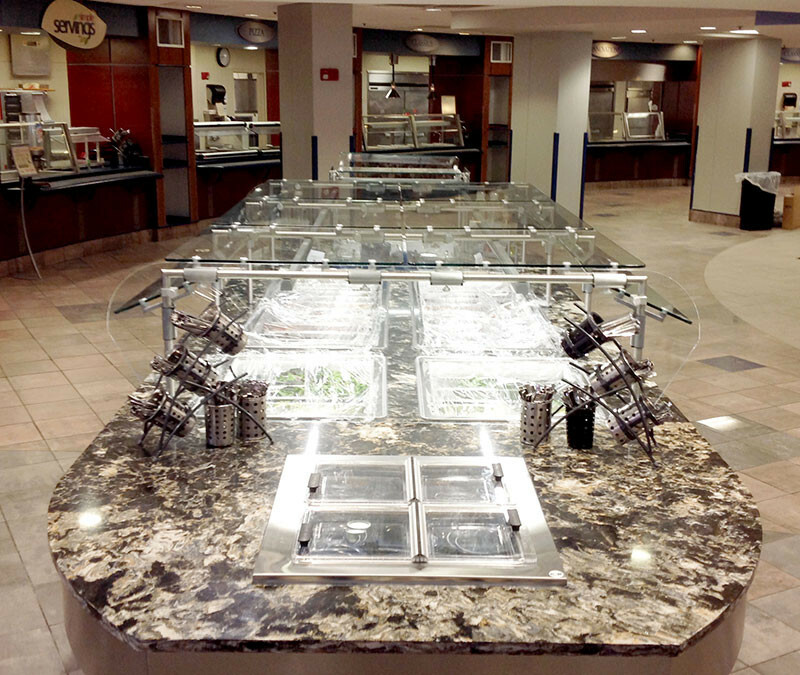 Surface One fabricated and installed Cambria Hollinsbrook Quartz Countertops in the Samford University Cafeteria. This is the main dining area for the Samford University students, located on the 2nd floor of the University Center and often referred to as ‘The Caf’. Durable and bacteria resistant Cambria Quartz surfaces are ideal for food service areas. 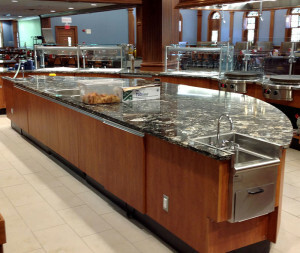 Surface One custom fabricated the Quartz slabs to fit the commercial restaurant equipment specifications of each serving station, including specialty sinks, hot and cold buffet units, steam tables, custom cooktops and food preparation stations. Samford University is located on Lakeshore Drive in Birmingham, Alabama. For details and more images about this project, visit the Samford University Project Page. Silestone is a brand of Quartz countertops that are manufactured by Cosentino. Quartz surfaces are a man-made product that is engineered using real quartz crystals blended with a small amount of polymer resins. This engineering process creates a beautiful surface that is often lower-maintenance than other comparable natural stone surfaces. Silestone Quartz can be used for countertops surfaces, wall cladding and other design functions. Silestone Quartz is made with a revolutionary anti-bacterial protection called Bacteriostatic Protection, created by Cosentino. The innovative bacteria resistant technology has led to an entirely new category of countertops known as bacteriostatic countertops. The Silestone formula is based on silver ions and prevents the propagation of bacteria making it the perfect choice for kitchen and bathroom surfaces. Silestone quartz is resistant to scratches, easy to clean and durable. Non-porous and highly resistant to stains such as coffee, tea, wine, lemon juice and other potential kitchen spills make this a beautiful, as well as highly functional, answer to your new kitchen. One of the hardest materials in the world, silestone has polyester resin elasticity and is formed using a vibrocompression system during production. Silestone is an earth-friendly product that has received the Greenguard certificate proving that Silestone does not emit substances that are harmful to the environment and can be used safely in enclosed areas. Silestone has also been awarded the “Greenguard Children & Schools Certificate”, for safe us in schools and universities. The Cosentino Group’s promotional video of “Silestone®, Above Everything Else” received a Golden Lion Award at the Cannes International Festival of Creativity. This short video offers insight into the world of Silestone’s inspiration and design. Silestone Quartz by Cosentino is available in a myriad of colors and can be used in bathrooms, kitchens, offices, restaurants, healthcare facilities and more. Contact Surface One to learn more about Silestone Quartz and other surfaces for your home or office.